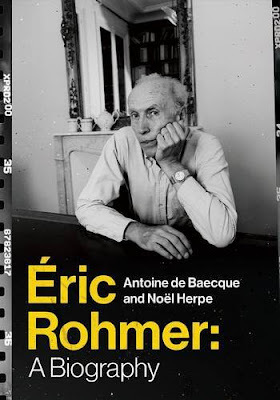 Who was Éric Rohmer? Well, for a start he wasn't Éric Rohmer. The man we celebrate as one of the central figures in the nouvelle vague began life as Maurice Schérer, and Éric Rohmer was just one of many names he adopted throughout his lifetime. When he wrote the novel Elizabeth in 1946 he published it under the name Gilbert Cordier, and when he was trying to raise money to make his first 16mm short films he did so as Antony Barrier. The Ciné-Club du Quartier Latin's Bulletin introduced Barrier as “a young American avant-garde director who has just won the prize given in the United States for the best amateur film.” The report was written by Chantal Dervey, another pseudonym. Why so secretive? In Éric Rohmer: A Biography (published in France in 2014 and now translated by Steven Rendall and Lisa Neil), authors Antoine de Baecque and Noël Herpe describe secrecy as “the true passion of his life” but note that this clandestine nature “did not conceal scandals, anti-conformist habits, or provocative commitments, and still less a complicated family romance or a closeted second emotional life.” Rohmer simply kept his personal and professional lives completely separate, to the extent that the Schérer clan (with the exception of his wife Thérèse, who was complicit in the lie) didn't know what he actually did for a living. Rohmer had grown up in a family driven by the importance of a classical education that looked down on cinema as a low artform, and Rohmer's mother died in 1970 believing that her son was working a teacher, rather than an acclaimed filmmaker and critic. “That would have killed her,” he said.